What if everything you set yourself up to be was wrong? Frances has always been a study machine with one goal, elite university. Nothing will stand in her way; not friends, not a guilty secret – not even the person she is on the inside. But when Frances meets Aled, the shy genius behind her favourite podcast, she discovers a new freedom. He unlocks the door to Real Frances and for the first time she experiences true friendship, unafraid to be herself. It goes without saying that I read a lot of YA. 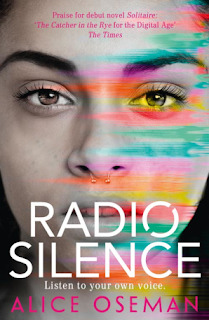 ‘Radio Silence’ is by far the best YA I’ve read this year and in my top 5 of all time. I loved it so much that I bought an extra copy to give away and share the joy (details below). I was slow to jump on this one because I’d read so much hype about it. Hype can be really off-putting, as I build a book up only to find that I just can’t get into it. Radio Silence is deserving of all the hype and more. My favourite part about this was the voice. I can’t remember another book for teens that so accurately captures the teenage voice. This authenticity goes for the first person narrative and the dialogue, all of which struck me as super realistic. I remember those feelings of working out who I was and who I wanted to be all too well and this book captured that beautifully. Radio Silence delved into issues like gender, relationships and identity in a way that felt really authentic and honest. Sometimes social media and technology can date a book but in Radio Silence they are used to create a rich, unique plot. Social media is woven into the narrative in a way that creates a snapshot of what it’s like to be a teenager in 2016. I like to say something that I didn’t like about a book to give a balanced perspective but for once I can’t think of a single thing. I loved everything about this book and I can’t wait to see what Alice Oseman will write next! Now for the giveaway! Simply follow me on Twitter (@yaundermyskin) and retweet the pinned tweet about this review for a chance to win. The giveaway is open internationally and ends Sunday 1st May, on which date I will let the winner know and announce it on my blog. I received an advance reader copy of this in exchange for an honest review. After reading the blurb on Netgalley, I was excited to be approved for this. The premise really intrigued me and I loved the concept of a book based on 'A Tale of Two Cities' by Charles Dickens. One of the main strengths of this book was that the rationale behind magic was explained creatively and the world was as darkly intriguing as I hoped it would be. In places, the plot turned disturbing and I think this was necessary for the volatile circumstances of this world. The pacing and the author's writing style also kept my interest. Lucie's family background and her experiences of both light and dark magic were more of my favourite aspects. Overall, I enjoyed this book. It ticked a lot of my usual boxes, including the well-realised world, plenty of action and romance. There was just something about it that left me not quite as invested as I like to be. I think this was a combination of the plot feeling quite familiar and Lucie's character not fully winning me over. I've read other work by Sarah Rees Brennan and I would read more of her books, although this isn't my favourite. The blurb of this book ticked so many boxes for me - I love anything Western-like and the hinted romance was promising. I took it on holiday hoping for a fun, fast paced read and that was exactly what I got. 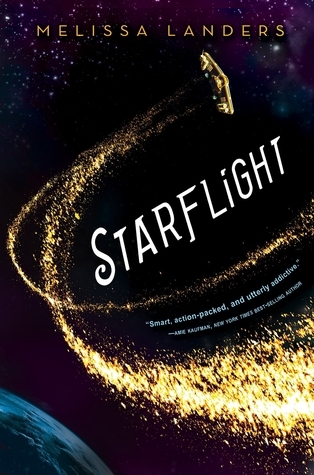 I haven't read a lot of YA set in space so this was a refreshing change. The sci-fi elements and the Western feel of a lawless realm complimented each other. My favourite part of this was the ship's crew: a flawed mixture of characters that were all interesting and well developed. The romantic elements were suitably drawn out and incredibly enjoyable (although a tad predictable). This was a thoroughly entertaining, action-packed read. I'll definitely check out the Alienated series by Melissa Landers after reading this.